Nords, the people of Skyrim, once conquered most of Tamriel. As a result, many Nords still believe they have the right to rule. Nords are sturdy, fair-haired warriors who are accustomed to the climate of bitter and frozen Skyrim, as a result they have developed a natural resistance to cold. Most Nords prefer simplicity over worldliness and value honour, glory and family. Nords are true weaponmasters, rarely meddling with magic. 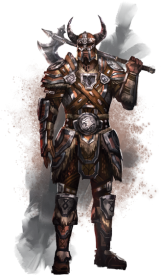 Nords are the dominant race of Ebonheart Pact, who is led by Jorunn Skald-King, a Nord. 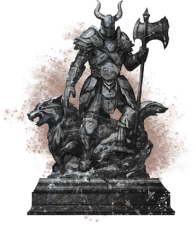 The other members of the alliance are Argonians, and Dark Elves, the former bitter enemies of Nords. In Elder Scrolls Online Nords have an increased experience gain rate with Two Handed Weapon skill line, and the racial skill Robust (also shared by Khajiit and Orcs) increases their Health regeneration in combat. Resist Cold increases Nords’ Cold resistance and maximum Health. The final Nord racial, Rugged, gives them a bonus in armour. Nords’ racial skills reinforce the mental image of Nords as tanky warriors. The bonuses to Health, Armour and the Cold resistance are all attributes a defensive warrior would want.